Robbie Williams is reuniting with Take That, but it's only for one night. Williams was a member of the band from 1990 to 1995 and again from 2010 to 2012, amassing twelve top ten hits in Britain. He then went on to one of the most successful solo careers in British recording history with thirty more top tens and eleven albums, ten of which hit number 1. 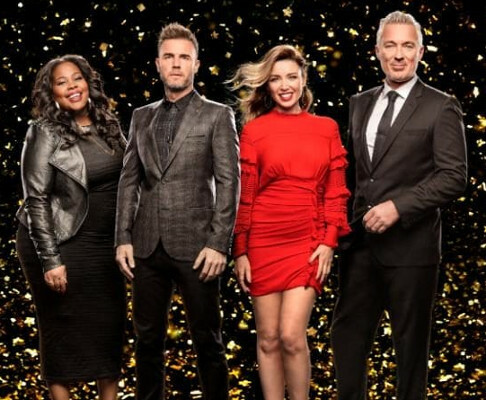 According to reports, Williams will be joining the current lineup of Take That with Gary Barlow, Howard Donald and Mark Owen during the finale of the talent show Let It Shine. The program, which is fronted by Barlow, is being held to create a group for the musical The Band which will include the music of Take That. Graham Norton and Mel Giedroyc host with Barlow, Amber Riley, Dannii Minogue and Martin Kemp of Spandau Ballet judging. Williams will also be a guest judge on the final program. It has not been revealed what song or songs the group will be singing, but they've promised it will be one of their big hits. For Williams and the other members, this is their first appearance together since Robbie was given the Icon Award at the BRITs last year. Previously, they hadn't worked together since the 2011 Progress Tour.